Superyacht regattas are not really my cup of tea. The last time I did one was in 2001 aboard Timoneer during the America’s Cup Jubilee in Cowes, with my former Pelagic partner and Whitbread shipmate Phil Wade. So it was with some reluctance that I was parachuted into St Barths for the Bucket regatta in March. If truth be known I was there to do two polar inspections on yachts going into high latitudes north and south. In the warm sunshine and a tradewind breeze it was frankly hard to concentrate on the job in hand. Likewise, the crews on board both boats were understandably preoccupied with preparing their yachts, turning them from cruising mode to racing mode. So it was very difficult to get our minds around growlers and bergy bits. There were 39 entries for the Bucket, which apparently is the most popular superyacht regatta on both sides of the Atlantic. This was a record year. These regattas are always a Who’s Who of professional racing. Flown in from all points on the globe in between their main racing campaigns, the young guys provide the muscle still required on the foredeck wrestling acres of light canvas; the older, wiser hands push the buttons that operate those sophisticated hydraulic control systems, while the sailing celebrities drive, do tactics and navigate. On Surama, a 131ft Huisman ketch built in 1997 and on her first outing as a racer, we had none other than the Volvo Ocean Race winner Ian Walker on the wheel. During pre-race coffee (US$6 for a cappuccino) and post-race drinks I ran into old shipmates I hadn’t seen in years, in some cases decades. They were surprised to see me in a pair of shorts and flip flops, so I came in for some lighthearted flak, many kindly commenting on how I hadn’t changed, some coming to the same conclusion: that it must be something to do with life in the cold – sort of like pulling a salmon fresh out of the freezer, unlike the long process of curing a sardine or a kipper with 30 years of tropical sun. And that’s right, for all those who were there, I don’t dye my hair – yet. Superyacht racing is not for the inexperienced or, for that matter, the fainthearted, even if an old hand. The loads on the sheets are measured in tens of tonnes and things do break. This has resulted in a few horrendous accidents that are sometimes mentioned, but not belaboured. They are now lessons to keep in the back of one’s mind always. As sort of a beginner, I was given a starter role as trimmer of the mizzen staysail. This might have been in jest, assuming Jon Morris, the crew boss, had read my column in this magazine, as the mizzen staysail winch was the only one aboard operated by a winch handle, something with which I am at least familiar. Other responsibilities were keeping Ian’s hat from blowing off his head – potentially serious under the tropical sun given he sports a cue ball. I couldn’t help sprinting forward uninvited though – a 30m sprint – to gather the MPS on takedowns and also overhaul the MPS sheet on the gybes before sprinting back to set the mizzen staysail. I have to admit that every time I did this it made me feel my age a bit. The superyacht racing rules are adjuncts that have been invented to make things safer for the crews piloting these vessels, some up to 600 tonnes displacement. There is a 40m distance rule that is monitored by range finders for crossing and mark roundings. What we guessed was 40m (our boat length) turned out to be 80m, so my conclusion was that 40m is really, really close. The thought of a hydraulic failure on the mainsheet winch for a bear away duck in a port/starboard situation was a frightening thought. Quite rightly, a mature approach is certainly needed – no cowboys need apply. Superyachts? No, they are ships with sails. Skip Novak is a columnist and regular contributor to Yachting World, and author of our acclaimed Storm Sailing Series, which you can also find on our website. 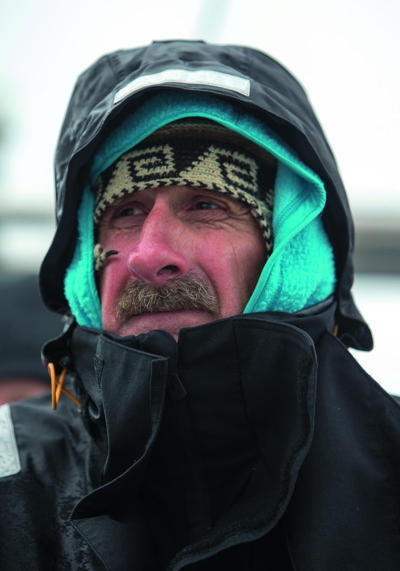 He was born in Chicago in 1952 and started sailing at an early age. He has raced in four Whitbread Round the World races and in 2001 co-skippered the 108ft catamaran Innovation in The Race round the world in 65 days, an event in which his future wife, Elena, also raced.